Yep, it is almost 1st of May – which means the motorcycles should be ready for the first official run of the Swedish season. If you are interested in finding out what is going on in our garage, may I guide you to Elisatravels.com? 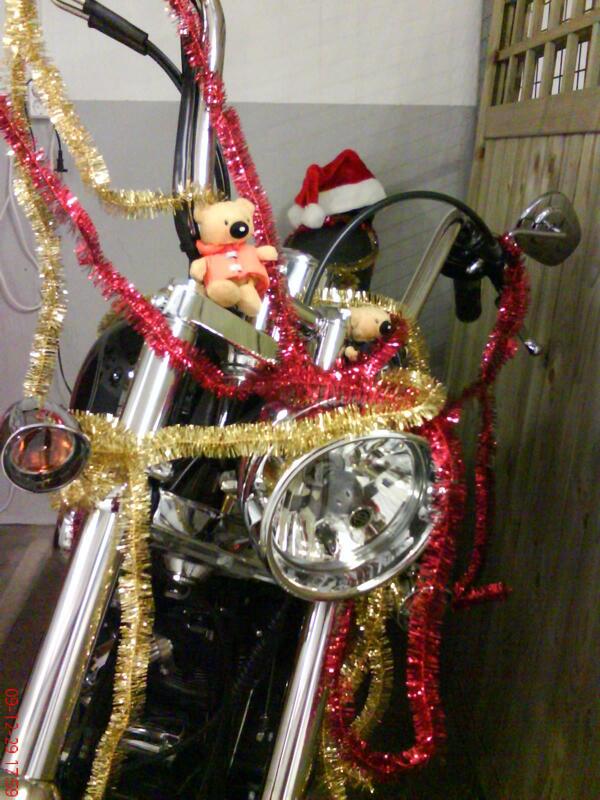 Stay safe and ride safely! Gone. Almost. And we did a lot. That despite being tired almost all weekend, at least on my part. Once again one should emphasize that cleaning a flat does indeed qualify as exercise. At least if you springtime-clean it, as we did. You know, dedusting all the shelves with books and so on. After that, we needed a brisk walk in the halfway sunny evening weather yesterday. Cleaning our “dust-lungs”…. Today we had a lie-in, until our laundry time started. 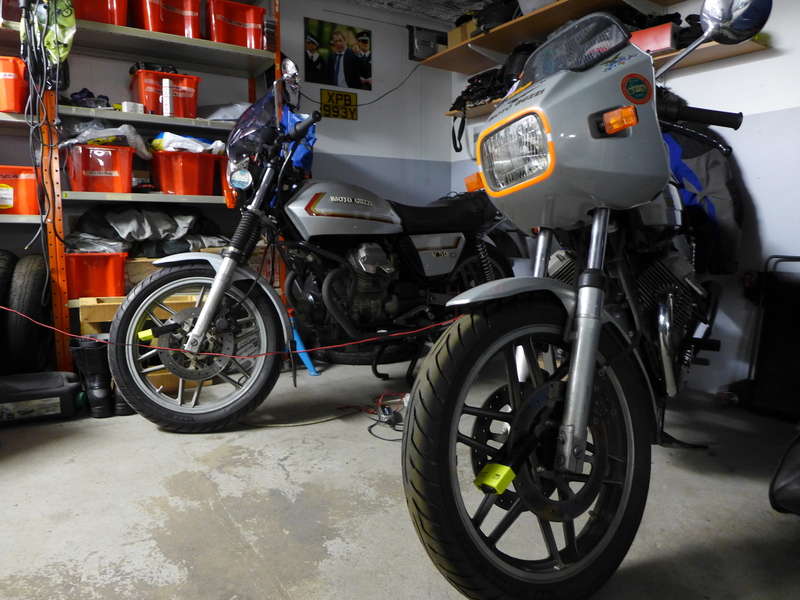 After that it was time to go to the motorcycle garage. We managed to establish that Hugo, the Moto Guzzi v50III most likely might be in for a set of new shock absorbers. A test ride needs to be done to get that confirmed, though. After garage, another brisk weekend walk, and I can say that I am awake sort of only now. Some good food and a glass of red will probably put me back into sofa and sleeping mode, though. And I don’t mind that. Tonight’s dish, in case anybody’s interested: Gratin with cod, spinach, lime, chili, tomatoes and cheese. On the side there will be garlic bread. The meal can (and will) be accompanied by a glass of red or a pint of our choice. A new blog baby is born! One that will talk about two-wheeled adventures – only. It is called Elisatravels.com – Why that name? You may check that out yourself over there, please. On this note I’d like to give a special thanks to @Maex for his idea with name finding (“Take the name of your motorcycle!”). An “About”-page and also the first two posts are online, lots more are being prepared by myself and by my beloved @Swedephotog. He is another motorcycle nerd who is sometimes worse than me in that respect. Anyway – you have more of a choice now: Wha’ever or Elisatravels! Hope you enjoy the read either way! Yes, I plead guilty. I did not update Wha’ever! for over a month now. Time to let you know I was on holidays, eh? The motorcycle enthusiasts amongst you might be curious to know that there soon will be a new blog starting just with motorcycle posts. I will be running that one together with Swedephotog, who is equally crazy (if not worse) about two-wheelers. Why we want to start a motorcycle blog? Well, somewhere we have to post the stories from this year’s 3-weeks-tour down to Northern Italy, don’t we? Apart from enjoying a great summer tour on two wheels, there was a lot of jamming involved over the last week. Or making jam, to be precise. Redcurrant, blackcurrant, gooseberry, strawberries and all that sh..e 😉 . Very sticky, I tell you, but also very sweet – like a few other things in life. Just very different. resulting in in total over 30 glasses of jam. All in all almost 9 kilos of fruit. Good that I did not think about all this while dealing with it 😉 . But the results are just heavenly – especially when you can enjoy them later on a dark winter night, bringing back memories from that summer… Or so. Thought on the side – next year I might start selling some of it. Too much otherwise for our family. Finally! The Swedish MC Season is on! After a traditional Fika (Swedish for Coffee-break) at “Fräcka Fröken” in Norrköping all of us set off northbound direction Jönåker via the old E4, then across to the East and down again. We took a ferry across Bråviken, like one can see in the picture above. All in all it was a trip of approximately 115 kilometres in total, just about right for not getting too cold on the bike in these temperatures. This is the route we took. After a backlash with quite some nippy days just above 0 Celsius combined with snow showers, the sun came out again today, and it is slightly getting warmer, giving hope that the 1st of May next week won’t be the coldest one in the last decade. 1st of May? Yes. That is when the motorcycle season starts in Sweden. And since I know of at least two women who contemplate since years whether to take their license or not – here is my advice: Just do it! I borrowed the title of this video partly for the blog post – describes it best, I thought. Have fun, and I hope to see some of you around on 1st of May and during the season 🙂 . OK, one cannot complain really. Spring is coming. Today we have the first noticeable plus-degrees here. The snow is melting, but no flowers in sight yet. Apart from the ones you can buy. But – there are certain videos one can indulge in while awaiting the new motorcycle season. Like this one that two friends of mine put together. These are the days we are now very close to 🙂 . I hope. Pure Hooligan Awesomeness: London Scooter Riding Video | Fuzzygalore.com – Girlie Motorcycle Blog. And oh yes, man, this brings back memories. Like I already commented on Fuzzygalore, I did not go as crazy on my scooter. Probably due to the facts that it was a bit bigger (Honda SH 125i) and that I definitely was more cautious. Plus less experienced than these guys since I only took my learner’s license and later the full mc-license in London. Anyhow, I used to ride to work in thick morning traffic, and if you wanted to get to work in a decent time, you simply had to go a bit crazy like these guys. Which was fun and risky at the same time. When I took my full license, at my school the instructors were divided between whether to show us how to ride in the “third lane” or not. The instructor of my group denied showing us how to do that. For our own security, as he said. And that should count for something, since he used to be one of the top-paid dispatch riders in London before becoming a riding instructor. He changed profession when he got married and had family, and his wife was not overly happy about him dispatch-riding. And this is my travel companion nowadays. Currently waiting in the garage for the few bits and bobs that need to be fixed before the next season starts. Despite the snow outside, it is not far away anymore – yay 🙂 . Hmmmm, tempting offer on Access Moto . And after all one should support the own fashion collection. Especially when despite the snow outside preparations for next season will start happening soon. And this one definitely needs care. 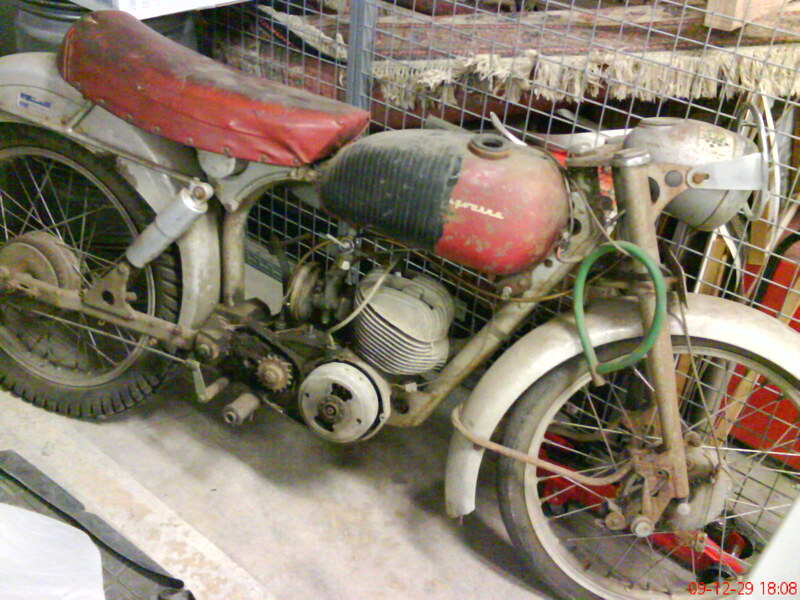 Nice old Husqvarna, though! Just went to the garage for giving Elisa, my v35 Imola lady a bit of TLC and discovered this with one of our neighbours. Ok, it is a Harley, hence why it might even like it 😉 . Habe gerade dieses Bild gefunden – heftig, oder? Kambodscha arbeitet nun an der Umsetzung neuer Sicherheitsstandards im Verkehr. Das bedeutet, dass im August 93 000 (!) Motorräder eingezogen wurden. 40 000 weil sie nicht mit Rückspiegeln ausgestattet waren und 39 000 weil die Fahrer ohne Helm unterwegs waren… Die Unfallrate mit Todesfolge sank im August um 15%. Tjaaa…. Sicherheit ist immer gut, aber wo bleibt die Realität? Motorräder in Ländern wie Kambodschia sind ein äußerst wichtiger Teil des täglichen (Wirtschafts-)lebens. Würde mich ja auch sehr interessieren, wo die konfiszierten Zweiräder landen? Sicherlich nicht auf dem Schrott. Wie der Autor schon sagt, warum nicht gleich sämtliche Fahrzeuge von der Straße nehmen?? One entire month without a single blog post, tweet or dent. Other people are only announcing their summer-offline-phase but I was really living it. And I must say that I feel somehow very relaxed, no feeling that I missed out on something etc. . So what on earth did I do during the last 4 weeks? – some days spent in (rainy) Grythyttan – on the only sunny day we had, we did not go motorcycling but mowed the lawn (boyfriend) and picked gooseberries and blackcurrant and made jam (me). – Making jam! Funnily enough I gave away all my good empty jam glass collection to my mum and my sister, not knowing at that time that they would have come in handy at my end as well…. Murphy again. Thank goodness there is the mother-in-law’s collection that I was allowed to plunder. My first jam ever was simple Blackcurrant one. Followed by a slightly more sophisticated Gooseberry jam with 10 year old Whiskey from the Isle of Jura in Scotland. The next jam was with Blackcurrant again, this time with Grappa that ripened in Madeira barrels (in other words: the expensive Grappa, not the one that one can also use to clean motorcycle parts). Comment of the boyfriend when coming into the kitchen after I poured the Grappa into the jam: “It smells quite strong when the berries get cooked”. I told him later that 4cl of his favourite Grappa went in there and caused the smell. Since he loves jam he didn’t seem to mind. Luckily. 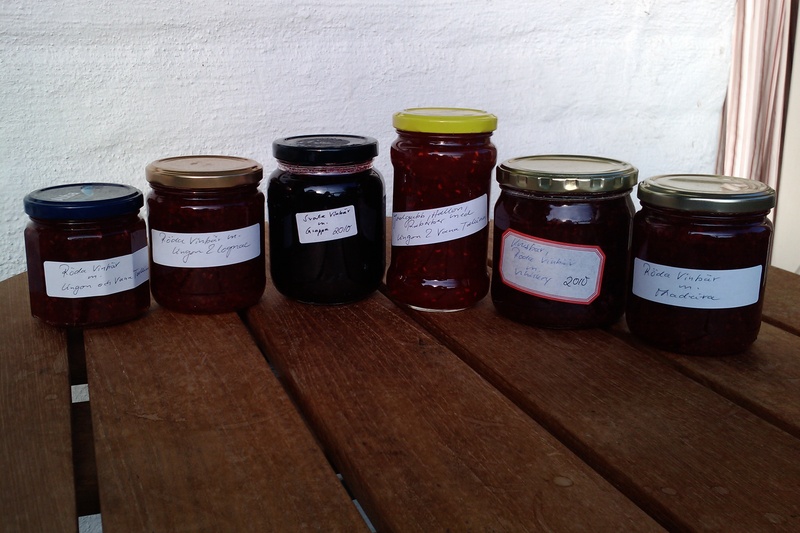 The next range was Redcurrant jam with Black Seal Rum from Bermuda, and yesterday was the last shift for this year. Gooseberries again, with Cassis this time. Quite decent as well, if one can judge it by the taste of the fresh and still warm jam. Making jam is quite job-intensive, especially cleaning the (bloody!!) berries, but also very satisfying when the results are unexpectedly good. So I will do it again. Next year. – Motorcycling – last but not least! As previously said, there is a certain shortcoming in that this summer, though, mainly due to work with the new flat. But – we managed to watch the 44th Classic Race on Sviesta which was great as usual. One can see motorcycles from the 30’s in action – the ones you otherwise only see in Motala’s Motormuseum, which we also visited when my sister and her husband were over for a week. We also met Kjelle from the Guzzi club on the way from Grythyttan to Norrköping. Together with three other club members (including Il Presidente Nicke) he is now on the way down to Mandello Del Lario, the hometown of all Guzzis. Needless to stress that I envy them???!!! Right now they are in Prague – and a really great diary they have. I just don’t know why on earth they chose Bloggagratis.se over WordPress.com… But never mind. So – what have you done during summer? There is by the way a nice saying “A weekend would not be a weekend if it would not be spent doing something totally pointless.” I reckon that applies to a certain degree to holidays as well, doesn’t it? Enjoy the summer. It is as always far too short! 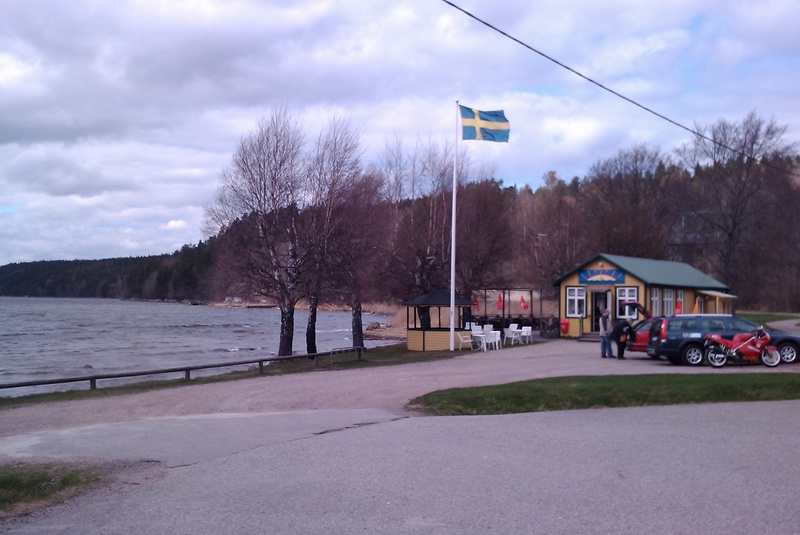 Update – a picture from a beautiful afternoon in Stegeborg, a place with quite some history. …. good riding equipment! Last weekend I did one of the great cources of SMC (Sveriges MotorCyklister). I was one of the few ladies taking part (think we were maybe 6 among 62 peeps). Apart from my bike, the second oldet on track (there was also a Honda from 1979), my leathersuit got a lot of attention. First I thought “Never seen a girl in leathers?” – but then someone dared to ask where I bought my suit. Then I understood of course. So I learnt that most lady riders here try to squeeze themselves into leathers or clothes for male riders – which then fit more or less, mostly less. The result: one does not feel comfortable at all. Too long legs and sleeves, no hips allowed to have etc. – we know it all. As a consequence the security of female riders is also potentially at risk when being out and about on two wheels, i.e. if you cannot zip your jacket and trousers together. By chance, when I still lived in London, I got to know about the shop GirlsBike2 – and the ladies there really know their stuff. 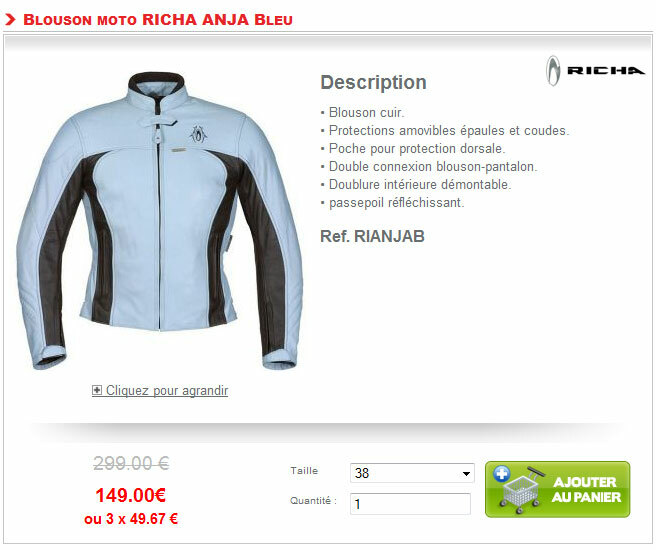 They are riders themselves and I got the most competent advice ever when buying my leathersuit and back protector. Another thing – back protectors for men are usually much too long for women’s backs, yet often ladies have to buy them simply as they are not given a choice. At GirlsBike2 you get advice in the shop but also on the phone and by email. They also ship their products abroad. Their range is a high quality one and made to fit you, no matter which body shape. You can i.e. buy Daytona boots, one of the best brands on the market. You buy one pair and it lasts forever. Handmade in Germany, by the way. Or you can order like me an Alpine Star leathersuit which will fit ladies with curves perfectly whilst giving you one of the best possible protections on road or race track. Motorcycle Season 2009 officially started! 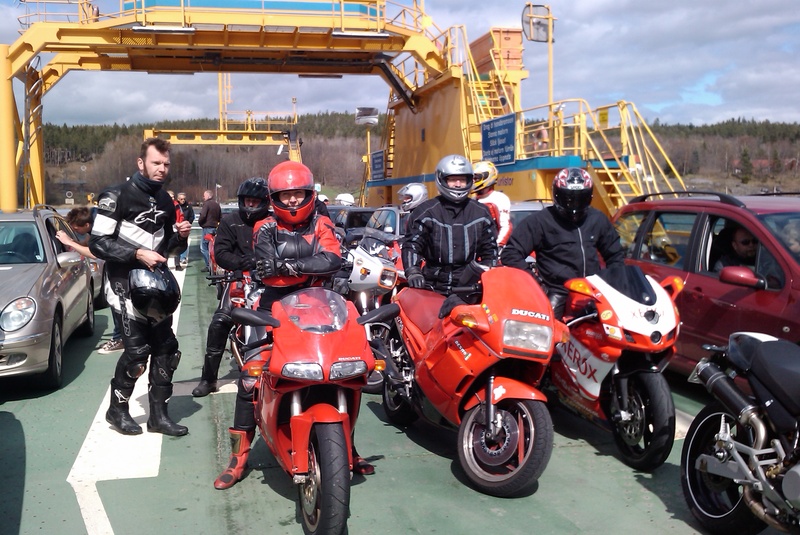 Last weekend, at Easter, the season for two-wheels officially started in Southern Sweden. Many motorcycles where out and about enjoying the first warm days and being surrounded by nice fresh air in a way that only motorcycling offers. We spent the weekend with the family in Grythyttan. That involved changing from winter tyres to summer tyres on the two family cars, fixing the old Russian foldable bicycle that one of the young ladies found in the garage stash and of course some severe fettling with the motorcycles. It took me about three hours to get the old rusty mufflers off Elisa (you may admire the shiny new ones on the picture below). At last a metal saw was the only way out since patience and cautious working with screw driver and hammer did not loosen the tight grip rust had formed between the exhaust pipe and the old mufflers. Putting on the new mufflers was then a very simple task. Elisa also got a new Bagster tank cover, and now I am in the pursuit of a fitting tank bag and some luggage that fits the rear part of the bike. Up to now a top box was sitting there, but as you can imagine it not only destroys the nice line of the bike but is not very suitable at higher travelling speeds which may include sidewinds – unless one fancies a bit of an extra challenge. Ebay, here I come! Any advice from the dear readers of this post are of course much appreciated. It is a shame that modern luggage mostly never seems to suit older bikes. On Easter Monday Elisa and I made the two hundred kilometres back to Norrköping where she happily arrived at the new garage. Did I mention that on Easter Sunday she started on first attempt and without any complaints whatsoever? She clearly enjoyed the first spin of the season around town, showing off her new equipment and telling everyone in her way “it is springtime and here I come again!”. On the way back to Norrköping one could not only experience the crappy (and faaaar too fast) driving of some cars but also the fact that Elisa’s indicators decided themselves when they wanted to work – which was usually not when I wanted them to function… Yesterday therefore involved some severe checking and cleaning of contacts and now I would say we no longer pose a danger to the traffic around us. After all, mid of May it is MOT time and one really does not want to do that twice… Never mind the costs that is. Feeling lonely? Have a meeting! Interessante Weblogs und wie man sie findet on Wie funktioniert Twingly eigentlich? Enter your email address to follow Wha'ever! and receive notifications of new posts by email.